HTTP Hosting Review 2019: Is HTTP Hosting a Good Hosting? Http Web Hosting offers web hosting plans and virtual servers, along with domain registration services. It also offers a variety of SSL and WordPress solutions. Http Web Hosting (or Http as it calls itself) from Pant Internet Solutions is based in Israel and was established in 2002. The company specializes in web hosting on virtual servers, which are equipped with high speed and super-processing capabilities. Its Dell servers equipped with SSD technology are stored in Rosh Ha’Ayin’s Cellcom server farm. Today, the bouquet of services Http offers include web hosting packages, virtual servers, and some additional services (domain registration, SSL packages, managed WordPress service and cleaning of WordPress websites). The company’s website is in Hebrew. 100% WordPress compatibility is one of the unique features of Http. If you have a WordPress blog or website, you no longer need to worry about running WordPress compatible scripts, installing WordPress plugins, etc. when you choose Http’s hosting plans. Http’s VMware-based storage environment is another unique feature of the company. If your website is large and attracts sizable web traffic, high-quality storage like those offered by virtual servers would be the ideal solution. Since Http uses ultra-fast SSDs and advanced Dell servers for its VMware-based storage environment, you can now ensure that your website is capable of handling heavy traffic and concurrent user sessions. Http’s hosting plans are very steeply priced when compared to the global market rates. 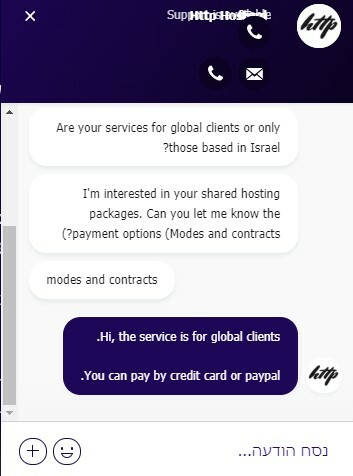 When you consider the monthly rate for its entry-level plan, it’s more than double of what some other hosting providers in Israel offer. Http’s hosting plans are payable monthly, annually, or biennially in Israeli Shekel. You can pay for them via credit card or PayPal. The company offers a thirty-day money-back guarantee. This means that if you decide to cancel your package within thirty days from the order, you get a full refund. If you got the domain as a free gift, the cost for it will be deducted from the amount credited to you. You can reach Http’s support staff via phone, email, and WhatsApp. Another option is to open an urgent support request by submitting an online form. The company also offers support via TeamViewer. Http offers a real-time chat option for providing pre-purchase support and consulting services, but the question I asked through it was only answered after four hours. Though all contact methods are advertised as being available 24/7, both my email and urgent call (to get answers to some general questions) went unanswered. Http Web Hosting has a Q&A section towards the bottom of most of its services pages, which is similar to a Help/FAQ section, and users who prefer to find answers on their own can take advantage of them. If you don’t mind paying a steep price for high-quality web hosting solutions, check out Http Web Hosting’s services. Wondering how HTTP Hosting stacks up against other Web Hosting companies? Enter any other Web Hosting company and we will give you a side-by-side comparison.